Guys! Look at my ridiculous sweater!!!!! It’s huge and puffy, it’s totally shapeless, fits kinda weird and is overall pretty ridiculous, but I love it! But wait, let me give you the back story! 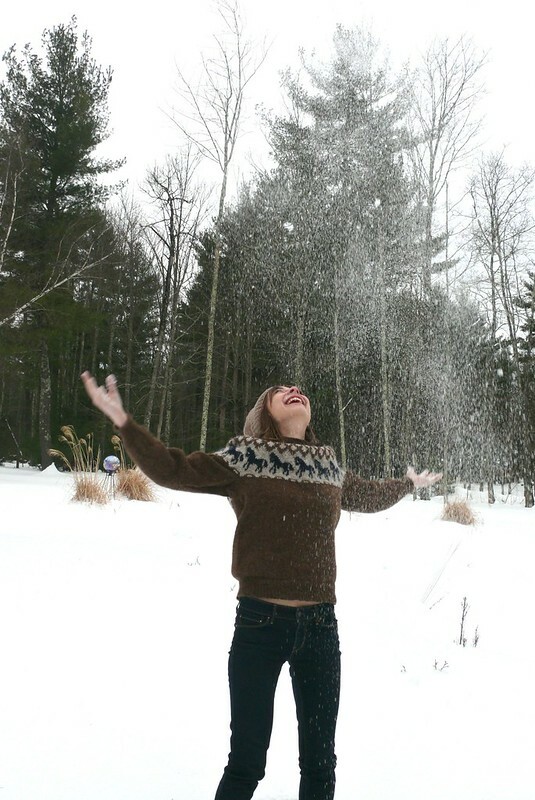 This sweater’s story starts back in July, when Man Friend and I spent a week in Iceland. You guys. Iceland. It’s amazing- absolutely beautiful, unique, and just… amazing. All the people we met were warm and kind, and to top it all off, they wore incredible hand-knitted sweaters! I was sorely tempted to buy a sweater at the Handknitting Association of Iceland, and while the price was great for something handmade (about 115USD with the exchange rate while we were there), it was just a bit more than I wanted to spend. SO, I decided to take a stab at knitting one myself, even though I hadn’t been knitting much at the time and had never tried colorwork. 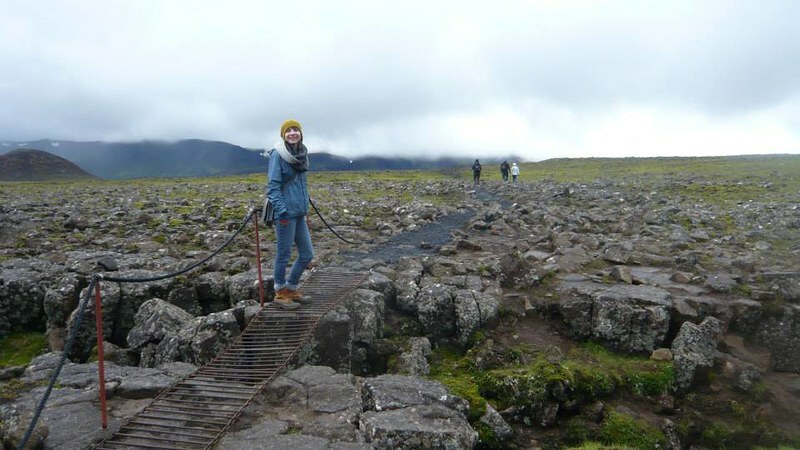 Now, the one major downside of visiting Iceland is that it’s EXPENSIVE (to Americans, anyway… maybe costs don’t seem as high tof European visitors). Food, lodging, clothing, everything was really costly… except for yarn! I purchased the yarn and two patterns for about 30USD… cheaper than I could possibly source 100% wool yarn anywhere in the States! You can also find knitted items and yarn for sale everywhere- gift shops, drugstores, grocery stores! Crazy! 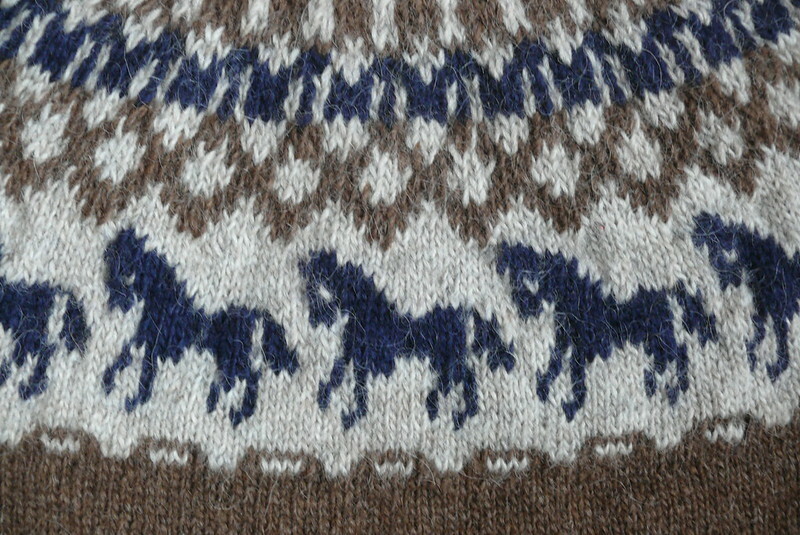 There were quite a few patterns to choose from, but I knew I wanted this one: Hestapeysa (sweater with horses). It’s available as a free download, in English, if you want one of your own! Dudes, I was one of those little kids obsessed with horses for as long as I can remember. I actually got a pony when I was maybe 7 (long story short, my dad found an ad in the paper for a $75 pony… the only catch was that it had never been touched by a human hand!) and the highlight of my childhood was pretending like I was winning the Kentucky Derby or riding for the Pony Express. 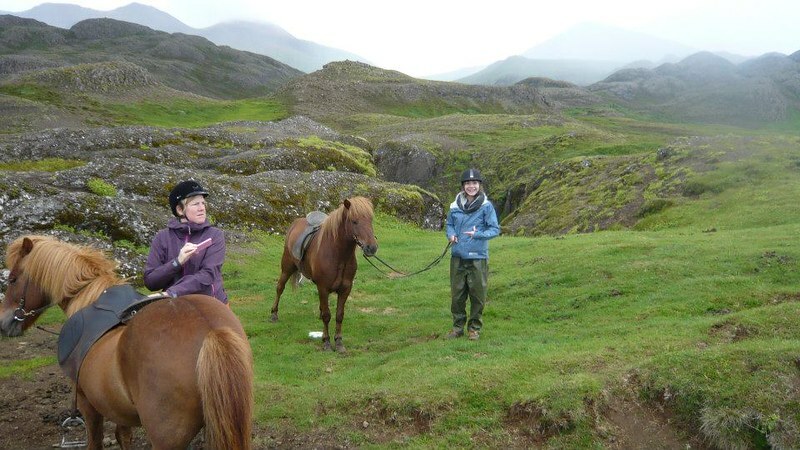 So when we spent a morning riding horseback in the Icelandic hills and valleys, I was on cloud nine! 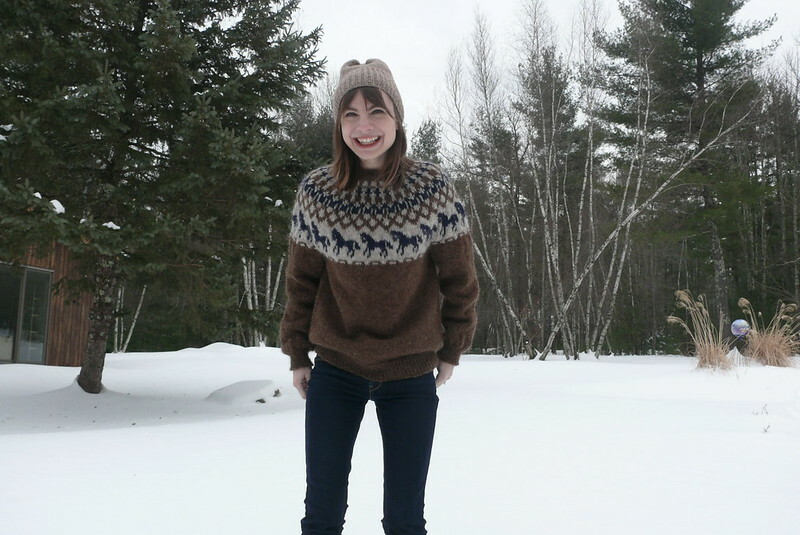 I wanted to make a horse sweater to commemorate what was, honestly, one of the happiest days of my life! Fun fact: when the folks at the horse farm found out I’d grown up riding a pony, they got really excited to find me a horse that would be “really fun”. 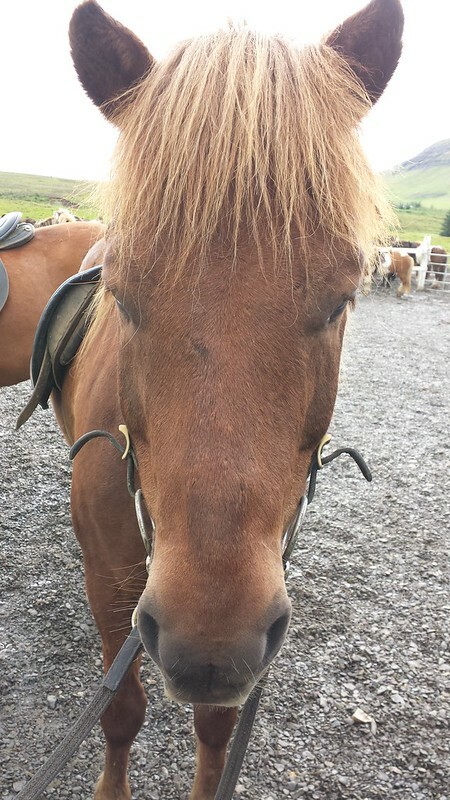 I’m missing the fear normal people have around large animals, but even I got nervous when they told me that the horse’s name, Rody, was an old Viking word that meant “blood smear”. They insisted that the name referred to his color rather than any murderous tendencies, but still! Rody was a bit crazy, but awesome, and we had a great time together- he was a lot like a NYC driver in that he loved tailgating and wanted to pass every other horse in order to go faster! 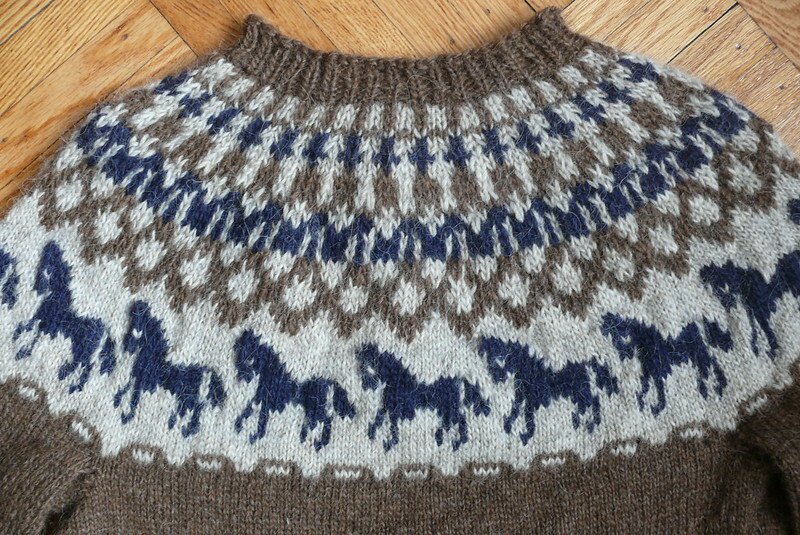 OK, OK, I could go on about horses for hours, but I’ll get back to the sweater! The yarn is Ístex Létt-Lopi, which is aran weight, so it knits up pretty quickly. I knew I wanted to use kinda natural colors for the sweater, so I chose acorn heather and light beige heather. But I liked the idea of using an unnatural color (for horses), so I picked blue for them. The blue horses really make me smile! The yarn is really warm and is a bit itchy, so I’ll always wear this with something underneath it. There’s just one women’s size, meant to be about 43″ at the chest, but my gauge was a bit tighter, and I calculated that I would end up with about 40″, giving me 6″ of ease, which seemed right (you can see my Ravelry project here, if you like those sort of details). 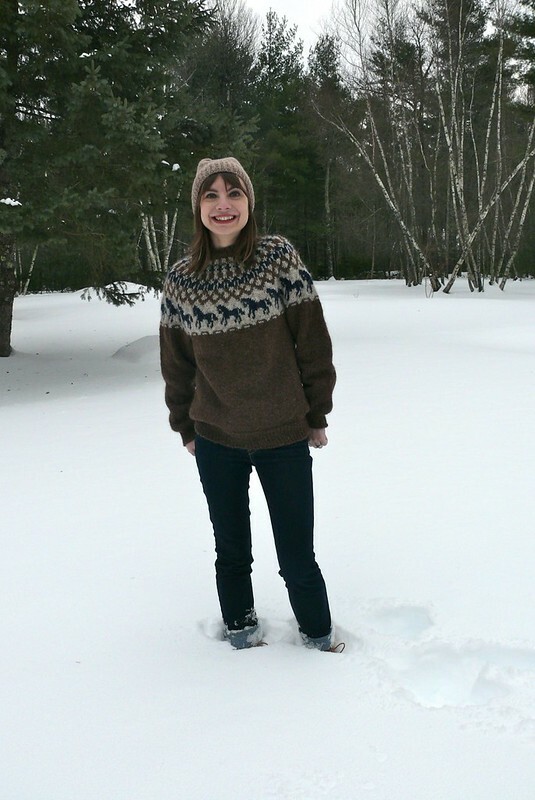 I had no idea how to get started with stranded knitting, so I reached out to Sarah from Knit York City, one of the most skilled knitters that I know. She pointed me in the direction of this post from Ysolda Teague explaining color dominance. I was still confused about how to hold yarn when you have more than one color, but I found this totally helpful post from Tasha at By Gum By Golly and it gave me the confidence to dive in. I decided to hold one color in each hand, knitting continental (like I usually do) with the left-hand yarn and English-style with the right. It was a little tricky at first, but got easier quickly. 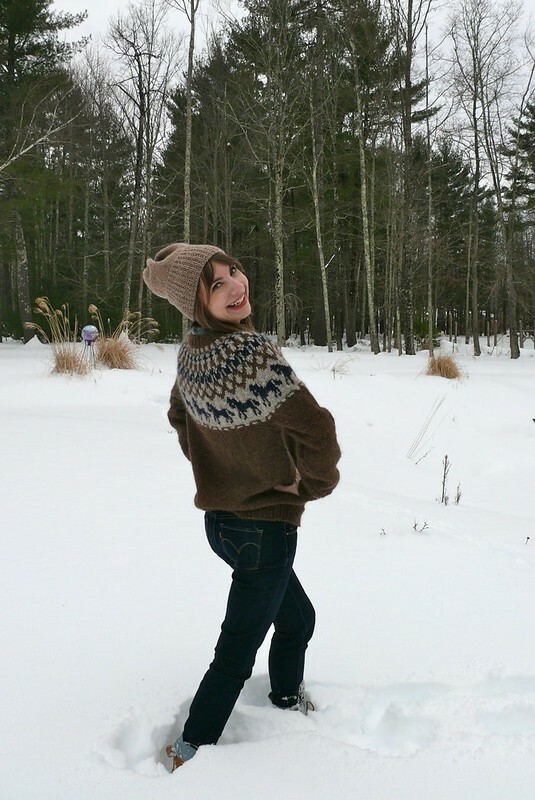 This Knitty post by Theresa Vinson Stenerson really helped me sort out the floats. I definitely didn’t keep my tension even throughout the yoke- I was worried after I’d knit the horses that they were too tight, so I really loosened up my floats above them and those stitches look a bit wonky and loose. But oh well! I’ll have a better idea next time! I started knitting this in October and was pretty slow. I picked it back up over New Year’s, joined the sleeves to the body mid-month, and then sped through the colorwork in a week. It’s just so fun to see the pattern develop- I stayed up past my bedtime nearly every night because I just wanted to do a few more rows! Colorwork looks really complicated, but once you’ve figured out how to hold the yarn, it’s easy to keep track of where you are in the chart and you’re just knitting stockinette in the round, so it’s really pretty quick compared to anything cabled. The sweater is a little crazy, and dude, it is WARM. My face and hands were cold when I was taking these photos, but I was otherwise completely comfortable (and it was about 20F!). If you’re not familiar with this kind of knitting, the color you’re not knitting with gets carried behind your stitches, so the yoke is a double thickness of yarn. Also, the sweater is so bulky that I’m wearing a flannel buttondown underneath it in these photos and you can’t even tell! Oh, I should probably mention the hat, which is also handmade. This was a quick knit with a single skein of Cascade Eco Cloud I’ve had in my stash for a long time- I thought the color would go nicely with my furry Gerard. You guys, Eco Cloud is SO soft and nice! It’s a chainette yarn made of merino & alpaca, so it looks really cool knit up and is really springy and squishy. Plus, the colorway is named “Bunny”! I used another free download, the Mock Rib Watch Cap. It’s very, very easy and would be a great first hat project! OK, tell me- do you knit? What’s on your needles? 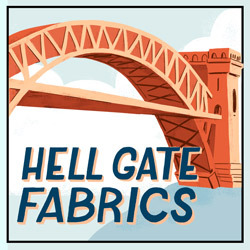 Any favorite patterns or recent projects? Were you a horse-crazy kid like me? Would you get on a horse named “Bloodsmear”?